This weekend I made the best chocolate chunk cookies. 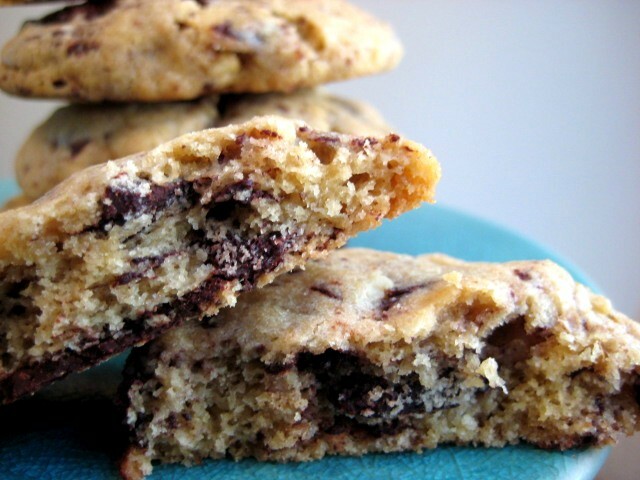 I can't promise they're the best chocolate chunk cookies you'll ever make, nor can I take any credit for the recipe. I adapted it from from Dawn Finicane over at vanilla sugar; Dawn has a self-proclaimed obsession with recreating Levain Bakery's cookies. I can't say if these taste like Levain's or not because, sadly, I haven't yet had the pleasure of having my mind blown at Levain. I left the ingredients and quantities in Dawn's recipe mostly unchanged (I increased the salt, baking powder and vanilla, and didn't use European butter), but employed a slightly different technique. Rather than shred cold butter with a cheese grater as Dawn instructs (too messy/melty), I cut the butter into 1/2-inch chunks and pulsed it in my food processor with the sugar. The key here is to create a dough that's studded with pieces of cold butter, a la biscuits or scones, as opposed to creaming the butter as you would when making most cookies. Also key is letting this dough rest in the refrigerator for at least 4 hours and preferably overnight. I've told you before and I'm telling you again: do not underestimate the importance of letting the dough rest and absorb moisture and flavor from the fats and liquids. 1. In a medium bowl, whisk together the flour, salt, baking powder and baking soda. Set aside. 2. In the bowl of a food processor or stand mixer fitted with the paddle attachment, process or beat the butter with the sugars just until lumps of butter the size of large peas are incorporated throughout the sugar. If using a food processor, transfer the butter-sugar mixture to the bowl of a stand mixer fitted with the paddle attachment. 3. Add the eggs and vanilla and beat on low speed just until combined; lumps of butter should remain. Add the flour mixture, chocolate and walnuts all at once, and beat on increasing speed until you're certain you're on the verge of burning up your mixer's motor. Remove the bowl from the mixer, set aside the paddle attachment, and gently work and fold the dough with your hands until the flour, chocolate and walnuts are evenly distributed. 4. Using a 1/4 cup measure and your hands, shape the dough into (approximately) 2-ounce balls. Work quickly; the butter should remain in cold pieces as opposed to warming enough to "melt" into the dough. Place the balls on a cookie sheet, plate or similar. Cover tightly and refrigerate for at least 4 hours or overnight. 5. When you're ready to bake the cookies (i.e., the dough has rested sufficiently), heat oven to 375 degrees F. Place the dough balls on parchment- or silicone mat-lined baking sheets, spacing them about 4 inches from the edges and each other. (I fit exactly 7 cookies on each of three, 13" x 18" half sheet jelly roll pans.) Do not flatten the dough balls. 6. Bake cookies at 375 for 8 minutes, then reduce the oven temperature to 325 degrees F, rotate the baking sheets 180 degrees and bake for another 8 to 10 minutes or until cookies appear set and are golden at the edges. Remove cookies from oven (still on the baking sheets) and cool on baking racks for 2-5 minutes, then move cookies directly onto racks to cool completely. (I simply slide the cookies -- still on the parchment paper -- from the baking sheets to the cooling racks.) Cookies will keep in an airtight container at room temperature for two days or in the freezer for a month. I found the flavor of these cookies to be even better the second day. I recommend you break them into chunks, slather them with peanut butter and shove them in your face. I'm not even kidding. Update 3/10/11: I've since made several more batches of these cookies, and have found that increasing the sea salt to 1 1/4 teaspoons makes these cookies amazing. Also, because the dough is not very sweet, I now prefer to use semi sweet chocolate chunks that are 55% to 60% cocoa solids. please for to give to me? i'm making these bad boys today. but with white chocolate chips and cashews. hollerrrr. Yum! I am lucky enough to frequent levain bakery. They really DO have te best cookies ever. 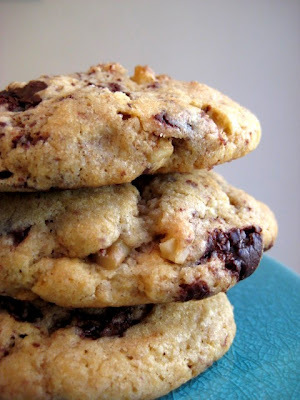 See if you can make their dark chocolate peanut butter chip cookie. I go back and forth trying to figure out which one I like most. I want to make these! Have you seen their cookies? Their huge! Seriously, like a half a pound each.